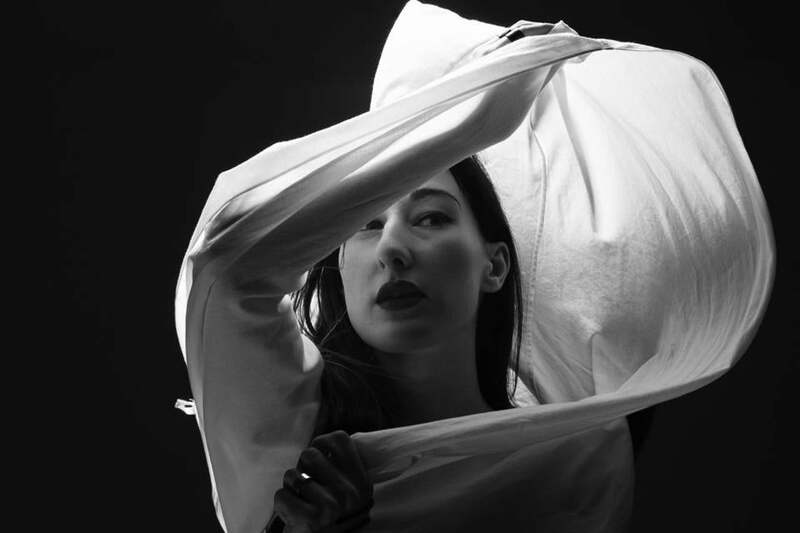 Nika Danilova records under the name Zola Jesus. “Okovi,” the fifth album that performer and vocalist Nika Danilova has recorded under the name Zola Jesus, is at turns harrowing and gorgeous. Danilova’s aesthetic is rooted in the grandiose — since 2009, the opera-trained Danilova has crafted ornate, imposing goth-electro that’s attracted fans like “Twin Peaks” mastermind David Lynch (who remixed her 2011 track “Contaus”) and French synthpoppers M83 (who featured her on their 2011 full-length “Hurry Up, We’re Dreaming”). “Okovi,” which came out earlier this month, stems from a darker place. Danilova wrote it near her former childhood home in the woods of Wisconsin, an area she returned to after a period during which she experienced intense depression and her circle of intimates faced down their mortality. The album doubles as a vessel for catharsis, channeling disparate musical ideas — the white-noise clamor of ambient music, the punishing overdrive of maxed-out synths, and the solemnity of spiritual music, to name only a few — on widescreen songs arranged to give Danilova’s searing poetry maximum impact. “Siphon” channels the mantra-like choruses and pleading spirit of hymns as she, accompanied by thundering drums, chants “Won’t let you bleed out/ can’t let you bleed out”; “Veka” brackets the urgent electropop at its core with eerie, abstracted soundscapes. Taken as a whole, “Okovi” is a powerful statement that speaks to the old saying about the only way out being through — with the path in question being very mindful of music’s potential for redemption and shared release. Danilova will perform Sunday at the Institute of Contemporary Art in Boston. The Globe spoke with her by phone the week after “Okovi” came out. Q. How does it feel to put this document of this intense period out in the world now? A. It’s pretty vulnerable, but time has created distance. I’m able to look at it a little bit more objectively now. Q. When did you start writing the record? How did going from an urban setting to a rural one inform your relationship with sound? A. Some songs were written in Seattle, but it wasn’t until I moved to Wisconsin about a year ago that I was really able to open up and tap in and finish it or be able to truly write. I became reinvigorated by the idea of creating textures, or creating soundscapes, and mimicking the feelings that I felt when I was in nature, because I was so at peace. It felt more connected to using music as a vehicle to express things that may be nonverbal. When I’m living in a city, I feel very overwhelmed by the taxonomy of people and society, and the infrastructure of human nature and technology; I don’t let myself be as empathetic and sensitive to my environment, because it’s so constricting. Moving back to the woods just allowed me to let go of all those neuroses and any predisposition toward there being a structure to things. Q. “Siphon” feels very hymn-like, and I was wondering if religious music played a part in your inspirations. A. Yeah. I’m an atheist who loves Gregorian chants. [Laughs] I don’t want to use the word “spiritual” because that’s obvious, but there’s something more cosmic about religious music — it’s so transcendent. I’ve also been listening to a lot of Eastern European folk music, which has the same sort of urgency to it — it’s got this wisdom in the melodies. That song in particular is so, so precious that it did feel sacred. When I was writing “Siphon” I wasn’t thinking about that consciously, but it is a plea, and I think a lot of sacred music is a plea in one way or another. Q. What sort of ideas did you have in mind when you were figuring out how to perform these songs? A. I’ve been really trying to adapt the songs for the stage and not try to do them verbatim, because I’m trying to maintain the vulnerability of the music. That’s most important. My bandmate is playing guitar for the first time ever on tour, so that’s definitely very new. Q. What does adding the guitar bring to the overall atmosphere of your live set? A. I’ve always been very resistant to guitar because there’s a lot of stigma — when people see a guitar onstage they [think they] know what they are going to get. Alex De Groot, the co-producer of the album and a longtime live bandmate [of mine], guitar is his first instrument, and [playing] comes naturally to him. But I’ve been really pushing him to bastardize the instrument in a way where it’s not so clearly guitar, and maybe it’s more sustained, or languid. I like that the guitar has an ability to create such dynamics — that’s really opened up this live show. We’re able to play off of each other more. Q. How did you decide on this particular collection of songs? What was the process of figuring out how you were going to flow it? A. I’m not going to lie — I was feeling very skeptical about this record because I was going through such a dark period that I didn’t value anything that I was doing; I didn’t think there was anything there. At the end of the process Alex De Groot and I sculpted the album. I was very inspired by concept albums like “Low” by David Bowie and maybe Nine Inch Nails’ “The Downward Spiral,” where it’s more abstracted and not every song needs to be the song. It was really fun to craft an album while creating an environment, rather than a collection of potential singles. This to me is so much more about the journey because these songs were written over a very difficult period of my life and the lives of those around me. I wanted that to be honored. When I realized that I had the freedom to do that, the album came together — it became very intuitive.